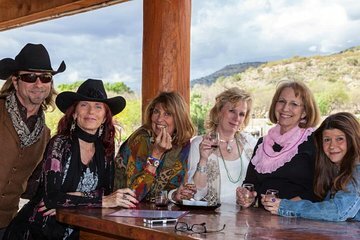 Pleasure your palate with some of northern Arizona’s most popular wines on this 4.5-hour wine-and-dine adventure in Old Town Cottonwood and Jerome, including transport from Sedona. Make your way to three or four wineries, and enjoy four to five tastings at each stop. Take a break for lunch at a nearby restaurant, and bring home a souvenir wine glass from Page Spring Cellars. Plus, numbers are limited to 14 people on this small-group tour, ensuring you'll spend an intimate day with a small group of like-minded wine lovers. Your 4.5-hour wine-and-dine adventure in Old Town Cottonwood and Jerome starts with an 11am pickup from your Sedona hotel. Be picked up in a minivan, and meet your guide and the rest of your small group. Your first stop is for lunch at a local-favorite restaurant. Once your belly is full, your group takes off for the first winery on the day’s agenda — Pillsbury Wine Company. Here sample wines, and hear about the winery’s background story. You might also visit Arizona Stronghold for a few tastings, or go there instead of Pillsbury Wine Company — it just depends on timing. The last two wineries your group visits are Page Spring Cellars and Oak Creek Vineyards. If the weather is nice, you can stroll around Page Spring Cellars for great views before taking off to Oak Creek Vineyards. Bring home a souvenir wine glass with you, too. At Oak Creek Vineyards, indulge in a cheese-and-cracker plate with your pairings. Afterward, hop onto your van for the ride back to Sedona.